Can Your Company Reduce Its Carbon Footprint and Disposal Costs? An often overlooked area in which companies can reduce their carbon footprint relates to the transportation of the hazardous waste they generate. Out of sight out of mind is often the mindset that permeates the industry, but understanding where your waste is being transported to and by whom can drastically reduce the carbon footprint generated from the waste that a company produces. 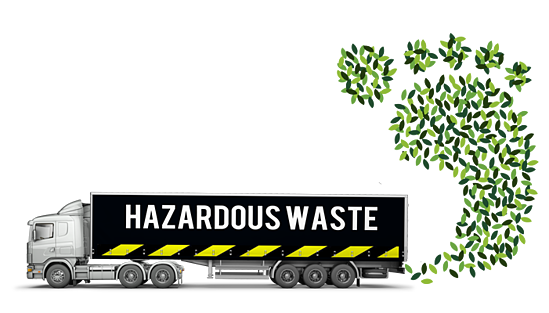 Granted, while the carbon footprint is actually generated by the trucks used to transport the hazardous waste, where the hazardous waste disposal actually takes place can have a meaningful impact on emissions produced and the total cost of the waste disposal. As we take a closer look at some actual scenarios, it’s important to note that the actual carbon footprint calculations can vary somewhat. For example, fuel consumption is not a constant. There are several factors that can alter the fuel consumption, such as the age of the truck, aerodynamics of the truck, if it is traveling uphill or downhill and the general maintenance of the truck. For the purposes of the demonstration, we will assume 6 miles per gallon as a reasonable estimate. The following calculations can be used to determine the carbon footprint of any type of disposal. Whether you are disposing of light bulbs or highly toxic hazardous waste, the calculations would be the same. The only adjustment you would need to make is determining how much of the load you are responsible for. For example, if a typical truck load holds 44,000 lbs. of material and you are responsible for 22,000 lbs., then you would need to reduce the final carbon footprint result by 50%. A full truck load of Hazardous Class 3 Flammable Liquids is being disposed of by your company. Your hazardous waste transportation company picks up the waste and is ready to transport the waste for disposal. The transportation company has two options for the disposal since there are only facilities in the United States that handle the disposal of flammable liquids. Los Angeles to Benton Arkansas. Los Angeles to Tecate Mexico. Checking with your transportation company about where they intend to take the waste can make a significant difference in the amount of carbon footprint that is generated. You may be thinking how can my waste be taken outside of the United States to be legally disposed of? Our friends at Temarry Recycling were the first company to be legally licensed to recycle hazardous waste both in Mexico and the United States. 1000 miles / 6mpg x 2.77 = 461.68 KG is the Carbon Footprint. 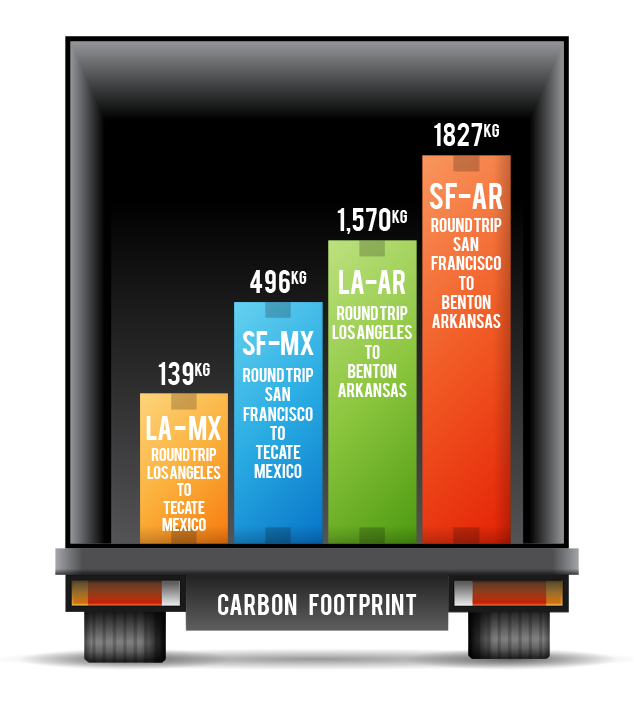 We know the total Carbon Footprint on this truckload is 461.68 kg. A full truck carries 44,000 lbs. So, 461.68 / 44,000 = 0.0105 per pound. Multiply by 10,000 lbs = 104.93 KG of Carbon for this partial shipment. If the material you are disposing of can be delivered to different locations, knowing ahead of time where you prefer that waste to be delivered will not only save the amount of carbon footprint that is generated, but will also dramatically reduce the costs associated with the disposal. Can you help reduce your carbon footprint and reduce your disposal costs? Yes. Working closely with your hazardous waste transportation company and establishing a relationship in where they know what your expectations and corporate values are, will help your business and the environment.